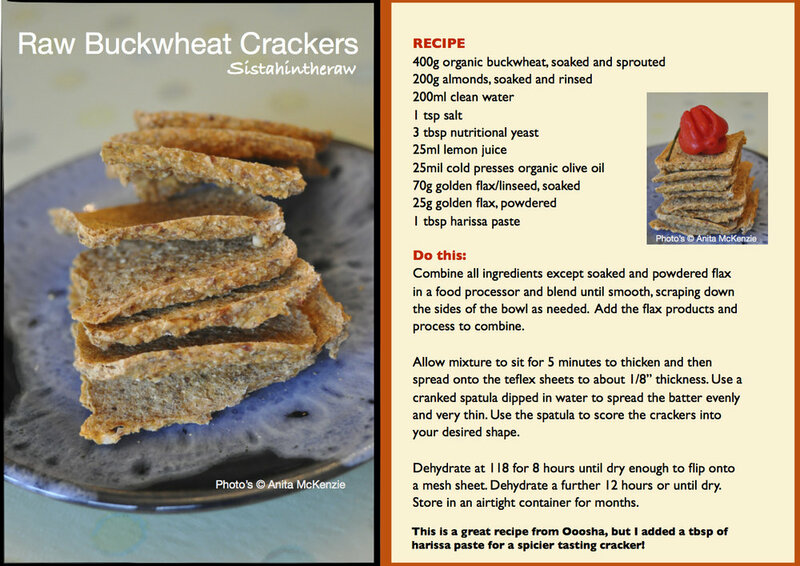 I have sampled several different raw cracker recipes and this sprouted bucket cracker is one of my favourites. I am a great lover of herbs and spices and so I encourage you to experiment with your own favourite flavours. Start by adding a little herb or spice, gradually increasing the amount, as you become more confident with the amplified flavours that raw and dehydration bring, you will learn exactly how flavourful you prefer your crackers to be. Say goodbye to pesticides and preservatives, sprouting is easy! Anybody can do it. Say hello to live nutrition. Sprouts are the most nutritious whole food on the planet. This is high frequency, high vibration living food that conveys its’ life-force energy to you! Germination releases dormant vitamins, minerals, and enzymes that make them on average ten to thirty times more nutritious than even the best raw, organically-grown vegetables. Buckwheat promotes proper circulation, digestion and elimination with its anti plaque properties and it helps neutralizes the effects of radiation. Rinse twice a day for one day or two. Double rinse each time. Repeat the process until little shoots appear. They are then ready for harvesting for this recipe. Don't let them grow for too long. Email me if you have any queries.